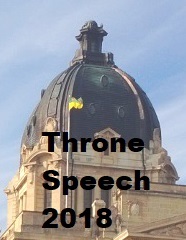 This section contains transcripts of Randy's participation in Legislative Assembly deliberations during the 1st Session of the 26th Legislature. The Assembly sat on the following dates: December 10 to 20, 2007; and March 10 to May 15, 2008. All contents are ©2019 Randy Weekes, MLA Biggar - Sask Valley unless otherwise noted.